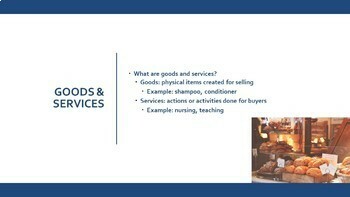 Factors of Production Economics Lesson! Truly memorable lessons are always my goal. After all, if a lesson is engaging, interactive and relevant, students are bound to remember the content not only to pass the exam, but to remember vital economic concepts into adulthood. 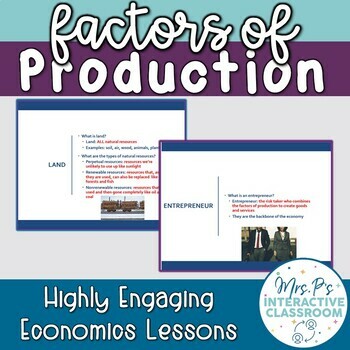 That’s why this lesson on the factors of production is jam packed with activities, clear content, examples, and student creativity. 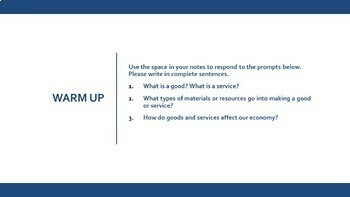 Students will learn the material and then apply the concepts they’ve just learned immediately as they create their own entrepreneurial story lines. 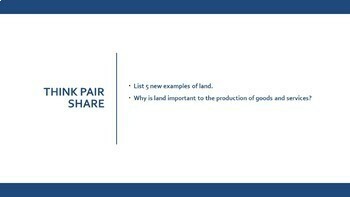 This lesson will teach your students all about the factors of production and why they’re important in the creation of goods and services. I use this as my second content lesson of the semester. Along with an interactive lecture, I've included engaging activities, think-pair-shares, and critical thinking opportunities throughout the lesson. I usually teach this lesson in one 50-minute period.